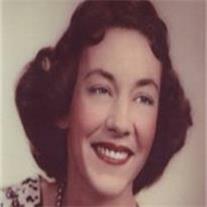 Mary Alice Griffin Hackitt, 85, was born on May 11, 1926. She died Sunday, Jan 29, 2011 in Mesa AZ. Mary was a World War II war bride, she married Jack Hackitt, a young lieutenant in the army at Ft. Worth TX in 1943. They were married 53 yrs. Mary and Jack had four children Jackie, Sandra and twins David and Dale. Mary was born in Kansas City, MO and lived most of her life in Mesa. She was preceded in death by her son Jack R Hackitt (Jackie) in 1969 and her beloved husband Lt Col Jack Hackitt in 1997. Mary is survived by daughter Sandra Macdonald (Duane) of Elk Ridge, UT, sons David (Gail), Dale (Tana) of Mesa AZ, brother Gary Griffin of Long Beach CA, 16 grandchildren and 37 great-grandchildren. Mary became an accomplished painter later in life and was also a member of the Mahnah Club. She and Jack loved to bowl and travel and most of all she loved every moment spent with her large family. Viewing will be Thursday Feb. 2 from 6-8PM at Bunker’s Garden Chapel, 33 N Centennial Way, Mesa. Interment will be at the City of Mesa Cemetery.